Very soon, participants of Argentum’s Senior Living Executive Conference will be collecting in San Antonio, Texas. If you’re like most busy professionals, you might find yourself under the gun to schedule meetings, let alone plan a little time to get out and see the sights. The good news? This town is packed with things to do – restaurants for every taste (and budget); shopping; adventure; and plenty of spots to simply relax and unwind. And take it from me, a resident of San Antonio, the choices can be overwhelming. Downtown. Every tourist (and local) loves the Riverwalk. This is a must do, and it’s free! Stroll this 15-mile beautiful winding pathway, stopping along the way for a bite to eat, pick up a souvenir or two, and snap a few pics. Most restaurants have menus posted outside and offer both indoor and outdoor seating. You can also “ride the river” via Go Rio San Antonio Cruises for a narrated, guided tour of the area for app roximately $9-12. The Alamo. If this is on your bucket list, you’ll be happy to know it’s an easy 7-minute walk from the convention center and open 9:00am-5:30pm daily. Consider the San Antonio Missions as well if you have time to immerse yourself in some San Antonio culture and history. Dining. So many places, so little time! If you are staying in the downtown area, a few great selections would be Mi Tierra or La Margarita (for some Mexican fare and fun); Battalion (a restored firehouse) or Nonna (both are excellent Italian favorites); Bliss or Feast (both are unique New American); or Bohanan’s (amazing steaks and seafood). Start your day with an amazing breakfast at OCHO (Havana Hotel), Bird Bakery, or NOLA Brunch & Beignets. Reservations are required for most of these restaurants, and some are closed on Mondays. Want to venture out a bit? Hop in a Lyft and head to the culinary and cultural destination called the Pearl (7 minutes from downtown). Unwind with live jazz music at Jazz TX (make a reservation if you can). Book a spa treatment at Hiatus. Or enjoy shopping or dining at one of the many options available. Check out Supper (inside Hotel Emma), Southerleigh, and Cured. Another great spot for an afternoon of shopping, golfing, or dining is La Cantera. Approximately 20 minutes from downtown, this outdoor shopping venue is a favorite. You’ll find Neiman Marcus, Nordstrom’s, Macy’s, and everything in between. There are many fabulous restaurants including Perry’s Steakhouse, an excellent spot to impress a client or enjoy a special evening. La Cantera Resort & Spa is across the street and offers exceptional spa services and two championship 18-hole courses. If adventure is calling you, consider Top Golf (high-tech sports entertainment complex anyone can enjoy), iFly (indoor skydiving venue), or Bowlero (small and large bowling events with interesting “lane side” menu options). All are within 20 minutes from downtown. 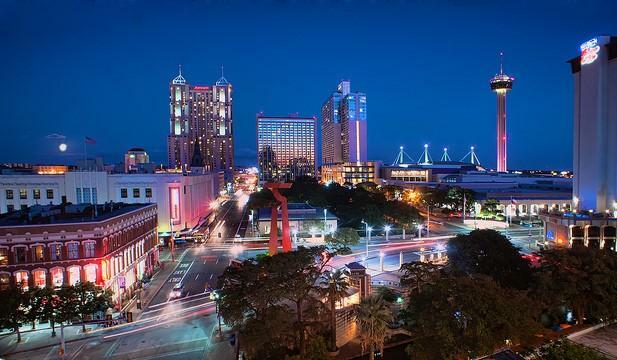 With so many options, it’s no wonder San Antonio is a popular favorite for many who make the “conference scene.” And, with a bit of this insider’s recommendations, here’s hoping this trip is your best yet!